In classical cross-country skiing technique, athletes use a diagonal stride in which both skis stay parallel to each other. In freestyle, which is generally faster, the athlete pushes the inside edge of the ski simultaneously backward and outward at about a 45-degree angle, similar to the motions of ice skating. Cross-country skiing also comprise part of the biathlon and nordic combined events. Men's Skiathlon - (30 km) - first half of the event is skied in the classic style, the second half as freestyle. Men's 4 x 10 km relay - each team has four skiers, each of whom skis one of the four relay legs. The first two legs of the relay are skied classical style and the final two are freestyle. Women's Skiathlon - (15 km) - first half of the event is skied in the classic style, the second half as freestyle. Women's 4 x 5 km relay - each team has four skiers, each of whom skis one of the four relay legs. The first two legs of the relay are skied classical style and the final two are freestyle. 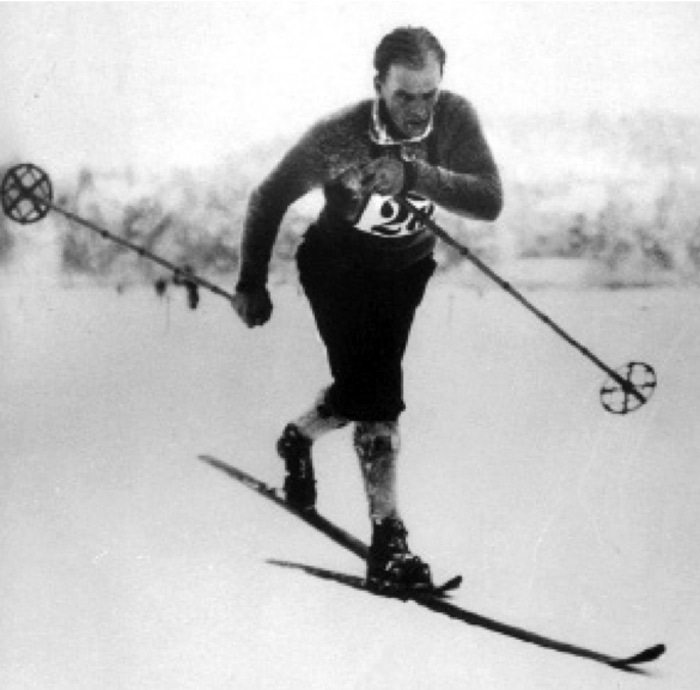 Thorleif Haug from Norway won all three Nordic skiing events (18 km, 50 km and combined) at the 1924 Olympics. He was also awarded the bronze medal in ski jumping, but 50 years later a mistake was found in calculation of scores, he was demoted to fourth place. The most medals won by any athletes at the Winter Olympic Games is 12 by cross-country skier Bjorn Dählie of Norway. In Sapporo in 1972, Norway's Magne Myrmo became the last athlete to win a cross-country skiing event using all-wooden skis. The women's events were first contested at the 1952 Winter Olympics. In 1992, Vegard Ulvang and Bjorn Daehlie of Norway dominated the Nordic skiing men's cross-country races with three gold medals each. At Albertville in 1992, women's cross-country skier Raisa Smetanina of the Soviet Union won her 10th medal just before her 40th birthday to become the most successful, and oldest, Winter Olympic competitor, having participated in five Winter Games. At Lilehammer in 1994, Lyubov Yegorova of Russia won three cross-country skiing gold medals to match the Soviet speed skater Lydia Skoblikova's Olympic record of six gold medals. In Nagano in 1998 in the women's cross-country event, Russian Larissa Lazutina was the star taking home five medals (four in individual events) including two gold. Norwegian Marit Bjoergen had a successful 2014 Olympic Games, winning 3 gold medals. She became the most successful female Winter Olympian of all-time - with a total of six gold, three silver and one bronze medal. Angelica di Silvestri, representing Dominica, was entered in the 2014 cross-country skiing race, though withdrew before the start. If she had competed in her race, she would have become the oldest women to compete in a cross-country skiing race at the Winter Olympics, beating Norway's Hilde Gjermundshaug Pedersen who competed as a 41 year old at the 2006 Games.